This is a sealed box of 12 arcade game shaped containers featuring Hello Kitty. Her very own retro arcade cabinet is filled with cherry sours. 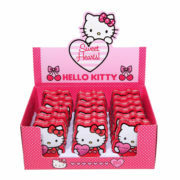 These candies come in an arcade game shaped container featuring Hello Kitty. Her very own retro arcade cabinet is filled with cherry sours. This is a 3.5″ x 3.5″ x 6.75 ceramic goblet featuring the art image of the face of Hello Kitty on the front and the back of her head with the name logo on the back. Hand wash recommended and it ships in a clear acetate box. Produced in 2013 this is a 12 ounce clear acrylic travel cup that features the image of the figure of the cultist Hello Kitty on one side and a rainbow with birds on the other. It is a double wall acrylic travel cup, comes with a straw and is BPA free. It is perfect for hydrating on the go, and the double wall keeps drinks cold! This is a 10.375″ tall x 6.75″ diameter cylinder ceramic cookie jar featuring the animated art of Hello Kitty on one side and her name on the other. 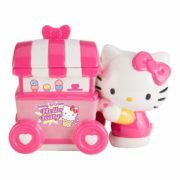 Produced in 2012, this is a 7 5/8″ long x 2 3/4″ wide x 6″ tall metal carry all tin tote or lunchbox featuring the art of Hello Kitty. The front is embossed. 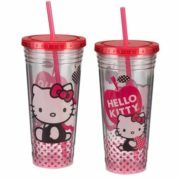 Produced in 2012, this is a set of two 7 5/8″ long x 2 3/4″ wide x 6″ tall metal carry all tin totes or lunchboxes featuring the art of Hello Kitty. This is a 10.375″ x 4.75″ x 8.55″ hand painted ceramic cookie jar featuring the animated art image of Hello Kitty pushing an ice cream cart. This is a limited edition release that is new and unused and ships in an illustrated box. Inside this can is a refreshing cherry limeade fizzy drink with no caffeine. 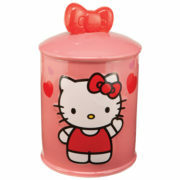 This is an unpened 8.4 ounce (250 ml) can illustrated with the image of the face of Hello Kitty. Inside this case of 24 cans is a refreshing cherry limeade fizzy drink with no caffeine. They are unopened 8.4 ounce (250 ml) cans illustrated with the image of the face of Hello Kitty. 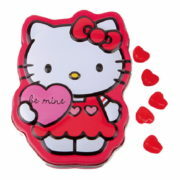 Produced in 2013, this is a 6.75″ x 6.75″ x 2.5″ embossed 3D tin tote carry all purse in the shape of the head of Hello Kitty. This is a new and unused, 18 oz, large, 6.5″ wide sculpted ceramic mug featuring the image of the head of Hello Kitty wearing a red bow. It comes in an illustrated box and is stored in a smoke and pet free environment. This is a sealed tin can box of 16 different images with a snap on embossed lid in the shape of Hello Kitty as each of the four members of the KISS rock and roll band and containing .8 ounce of candy mints. 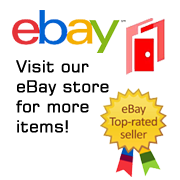 This is a sealed tin can that measures 3″ x 2 1/4” with a snap on embossed lid in the shape of Hello Kitty in a devil costume and containing 1.2 ounces of cinnamon flavored candy. 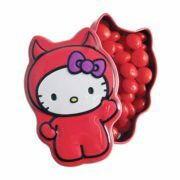 This is a sealed box of 18 tin cans with a snap on embossed lid in the shape of Hello Kitty in a devil costume with each tin containing 1.2 ounces of cinnamon flavored candy. 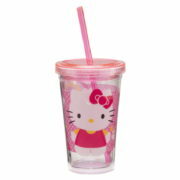 This is an 24 ounce double wall acrylic travel cup with a straw featuring a wrap-around animation design of Hello Kitty sitting with an apple logo with her name above her head. This is a new, unused, double wall acrylic travel cup with a straw and a photo quality design and is BPA-free. This is a 12 oz. 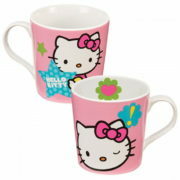 ceramic coffee mug that features the animated art image of Hello Kitty with her name logo. This mug is dishwasher safe and ships in a full color illustrated gift box. This is a sealed tin can with a snap on embossed lid in the shape of Hello Kitty and containing 1 ounce of sweet heart candy. This is a new, never opened tin measuring 3 1/8″ high. These Hello Kitty shaped tins come in a box of 18. Each shaped tin contains 1 oz of sweet heart candy just perfect for sharing. The top is embossed with Hello Kitty holding a heart in her hand that says “Be Mine”.